Our one pan shrimp and tomato pasta is a delicious combination of pasta, shrimp, tomatoes, and spices. It is so easy to make the the outcome is out of this world. It will be such a hit at any gathering. Give it a try and let us know what you think. I use baby shrimp but a bigger shrimp can be used. The basil is optional, but it adds some really nice flavor. Any type of tomatoes can be used in the recipe, but I like cherry. As always, you can add your own touches to the recipe. Add the oil and garlic to a pan. Saute until the garlic becomes fragrant. Put the tomatoes in followed by the chili flakes, salt, and pepper. Stir and fry for a minute or so. Place the pasta in and pour in the water, and chicken stock. Simmer for 9 or 10 minutes until the pasta is cooked. Add the shrimp in, olive oil, and toss until the shrimp turns pink. This should take about 2 minutes. Put the basil, lemon juice, and Parmesan in. Toss once again. 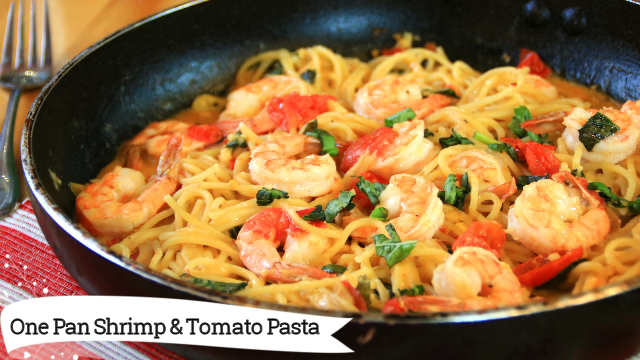 Turn off the heat, plate, and enjoy your one pan shrimp and tomato pasta.